A new tradition has begun at our Motherhouse. The vespers service for the month of November is now in the capable hands of our Molloy Chapter of Dominican Young Adults USA. Early last year, as part of our celebration of the 800th anniversary of the Order, our DYA group were the main celebrants of our November vespers. This year, as the entrance antiphon was being sung and the presider and person giving the reflection were processing into the chapel it was clear that this was going to be once again something special, and indeed it was. 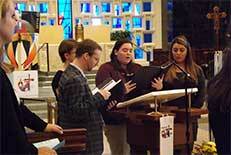 The voices of the young women and gentleman who were leaders of song were beautiful as they led us reverently in all of the songs as well as the chanting of the psalms. As I looked around the chapel at the sisters and associates as well as the parents of the student participants who were in attendance I could see how moved they were by these young people. “This was a beautiful and prayer event for all in attendance”, one sister said. 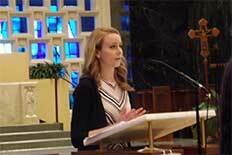 After one of the young adults read the scripture, one of the members of the DYA chapter gave a reflection. “She spoke of gifts and certainly she gifted us with her powerful words,” another sister said. It was very clear from all in attendance that the “Dominican Spirit and Charism” were infused in all of them,” said another sister. As part of the service, the young people who were to become new members of Dominican Young Adults, Molloy Chapter as well as those who were renewing their commitment to the organization stood up and professed their allegiance to the organization. At that point the entire congregation responded by resoundingly accepting their commitment and encouraged them to “stay the course.” Twenty young people attended the service all either committing or recommitting to membership in the organization. To view some of the videos for the vespers service go to our Facebook page.